These pictures were taken last year's fall in front of my father in law's house. My son is only 9 months old in this pic. These are just dashes of Fall that reminds us back home. Good thing we have a lot of photos. My two precious angels enjoying the leaves! Its always good to have a stock of photos to go through when you are feeling homesick! Enjoy and tell me what you think! I did not cook today because I'm a little bit lazy. I'm blaming Ms. Lady red for that, so hard to do things when you have cramps because of.... hayyyy... But I was so delighted when I received my husband's email from work saying that he's taking us out to lunch.. Wohoooooo! So after an hour session with my student Amy, we went to the Galley and had our lunch. We devoured some chicken cordon bleu with joejoe potatoes and vegetable salad... yummmmmy! But of course everywhere I go, I have my camera with me, always ready to capture the moment hehehe.. Here's EJ with Amy, Kimchi!!!! 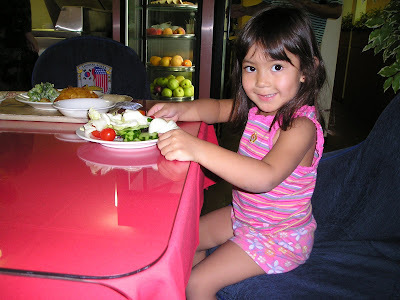 Here's my daughter enjoying her garden salad..